Tempers flared in the National Assembly on Tuesday as MPs adjourned the normal House business to discuss the ravaging drought in the country. Questions were raised on the use of billions of shillings allocated to alleviate hunger. The legislators also questioned the national and county governments' commitment to deal with the calamity that has affected about 13 counties. The MPs went for each other's throat during the debate on an adjournment motion by Ndhiwa MP Martin Owino. 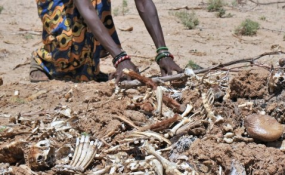 County governments were blamed for turning a blind eye as the effects of the drought continue to bite. At some point, majority whip Bernard Washiali (Mumias East) referred to Lugari MP Ayub Savula a "honourable thief" in reference to his case in court over the Sh122 million advertising scandal at the ministry of ICT after the Lugari MP tried to drag in the name of the Deputy President William Ruto in the mess. Mr Savula blamed hunger in the drought ravaged counties on individuals who had misappropriated funds meant for the construction of dams. Mr Washiali however, withdrew and apologised over the remarks even before Mr Patrick Mariru, the acting speaker, demanded that he withdraws. "The cause of this (hunger) is corruption! Billions of shillings have been lost on the dams that were meant to provide water for irrigation. Those defending dams have looted (the) money. They should tell us why people are dying in Turkana and other areas," Mr Savula said. Mr Ruto's name has been dragged in the Sh65 billion Arror and Kimwarer dams in Elgeyo Marakwet where Sh21 billion has already been paid to CMC di Ravenna, an Italian firm. The Italian contractor has, however, filed for bankruptcy in its home country, meaning that the billions already paid may have been lost. Directorate of Criminal Investigations George Kinoti has been investigating the matter and is expected to submit the file to the Director of Public Prosecutions Noordin Haji for action after interrogating Cabinet Secretaries Henry Rotich (Treasury), Mwangi Kiunjuri (Agriculture) and Eugene Wamalwa (Devolution and Arid and Semi-Arid Lands). Minority leader, John Mbadi (Suba South) asked the country's leadership to deal with the issue. "As a responsible leadership, we need to own up and apologise that we have failed as a country. A lot of money has been invested on food security, but we have white collar murderers in this country right from the county governments to national government," Mr Mbadi said. On Monday, Dr Ruto said that the government had allocated Sh14 billion to deal with the effects of drought. He claimed that the calamity was within manageable means because no one had died of hunger. The most affected counties are Samburu, Marsabit, Garissa, Isiolo, Mandera, Wajir, Baringo, Kilifi, Tana River, West Pokot, Makueni, Kajiado and Kwale.